Our Chefs have tested hundreds of Olive Oils and Balsamic Vinegars! These are the best! Exceptional taste and flavor! From the rolling hills of the fertile Modena area in Northern Italy, generations of experienced farmers produce the Trebbiano grapes that are used to make balsamic vinegar of Modena. The grape "must" is concentrated and aged in various casks of different woods to yield these unique and rich flavors! Our olive oils are all "Extra Virgin" from the first cold pressing. These oils & vinegars make perfect gifts! Facts about Olive Oil... Large Quantity Discounts are available! Our 7 year Aceto Balsamic Vinegar is extra thick. It is sweeter and smoother than most balsamic vinegars. It has been barrel aged for many years to create the perfect acidity content of 6 percent. We use it sparingly drizzled on baby greens, on gourmet pizza, vinaigrette salad dressings, pasta dishes, bread and oil, and on ice cream! This vinegar comes in a handmade glass bottle with a special stopper, 8.5 ounces. Exclusively imported from Modena Italy. Chefs Note: Many Chefs like the extra thick texture. We have done extensive taste tests with hundreds of Balsamic Vinegars and this is one of the best balsamic vinegar available for under $40.00 a bottle! Click Here for Italian Porcini Mushrooms! This truffle oil is one of the best truffle oils that we have tasted. Thick, rich, strong, full truffle flavor. It comes from the source of the most highly prized truffles - Italy. Our black truffle oil, with truffle that comes from Italy. 250 ml bottle. Chefs Note: Both have a wonderful truffle flavor and these are slightly addictive. 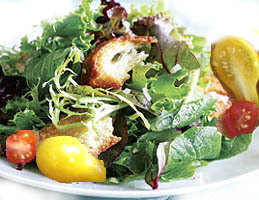 We like to use white or black with crusty bread and baby greens! It is strong enough to add a few drops to a sauce or vinaigrette dressing and taste the truffle flavor. 8 1/2 ounce bottle. 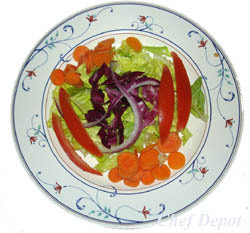 A healthy salad helps you fight cancer and live longer. Click Here for the finest Whole Truffles! Click Here for Chefs blocks and kitchen islands! Golden White Balsamic Vinegar from Modena Italy! This high quality Golden White Balsamic Vinegar has been aged for years in traditional oak and chestnut barrels. It is a golden white vinegar with a light and sweet taste (6% acidity). Excellent on sandwiches, salads, pasta, pizza, bread and used to flavor sauces! 16.9 oz. Chefs Note: We have done extensive taste tests with many white balsamic vinegars and this is the best made. We love it on sub sandwiches, baby greens with shaved Italian Reggiano or grilled chicken or seafood. We also use it in vinaigrette dressings! Click the green arrows and page links below to view more products! Balsamic Vinegar from Modena Italy! This high quality Balsamic Vinegar has been aged for at least 12 years in traditional oak and chestnut barrels. It is thick, smooth and rich with a slight sweetness. Excellent on salads, pasta, pizza, bread and used to flavor sauces! Some even like it on ice cream! 16.9 oz. Chefs Note: We have done extensive taste tests with dozens of balsamic vinegars and this is one of the best balsamic vinegar available! Click Here for Rock Maple Butcher Blocks! 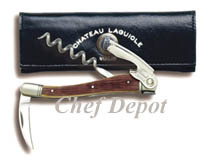 Our new Laguiole Waiters Corkscrew with natural Oak. 4.5 in. long, unbreakable oak handle, stainless steel bolsters, micro-serrated blade, cap opener! Made from oak wine barrels in France. Leather storage case. 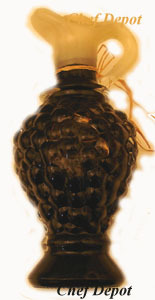 Features a small metal bee on one end. The etched "bee" emblem (Napoleon's symbol representing industry, efficiency and productivity), ensures that each piece is a genuine Chateau Laguiole. 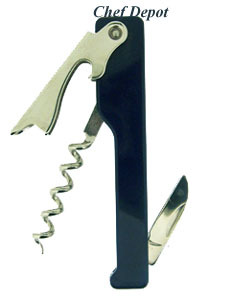 These openers not only make a perfect gift for any wine lover but a great conversation piece! Handmade in France. Click the bees for more Lagiole openers! More French & Italian openers for less! Our 10 year old reserve Balsamico Vinegar has extremely complex flavors, from Modena Italy. It is extra thick, sweeter and smoother than most balsamic vinegars. It has been barrel aged for over 10 years to create the perfect acidity content of 6%. Intense full bodied flavors. We use it sparingly drizzled on baby greens, on gourmet pizza, vinaigrette salad dressings, pasta dishes, bread and oil, and on ice cream! This exquisite vinegar comes in a handmade glass bottle and comes in a nice gift box. It has a glass & plastic stopper, 7 ounces. Chefs Note: We have done extensive taste tests with dozens of aged balsamic vinegars and this is one of the best available! This is our Special Reserve Extra Virgin Olive Oil. It is a refillable 8 1/2 oz. mini jug with a built in slow pour spout. It is an excellent mild flavored first cold pressed Extra Virgin olive oil from Tuscany, Italy. Add a clove of garlic and some herbs for a nice zesty dipping oil with fresh bread. Studies have shown that people who consumed 25 milliliters, about 2 tablespoons of virgin olive oil daily for 1 week showed less oxidation of LDL cholesterol and higher levels of antioxidant compounds, particularly phenols, in the blood. Chefs Note: We have done extensive taste tests with olive oils! If you buy the first cold pressed extra virgin olive oil, you are buying the best. We love the slow pour spout on this mini jug. Perfect for holiday gift baskets too! Large Quantity Discounts! Click Here for Olive Oil Facts and Health Information! Click Here for Butcher Block Tables & Carts. Sold out & No longer made. This is our Stainless Steel Olive Oil Can with tapered slow pouring spout. It is refillable, holds up to 16 oz. with a built in stainless steel slow pour spout. Using a bottle with a elegant tapered handle and spout to give you a more balanced controlled pour every time. Special no spill designed lid. Gift boxed. Chefs Note: Chef Pats favorite for oils! 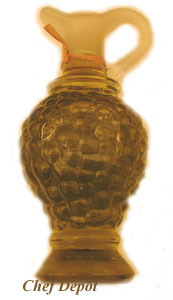 We have done extensive tests on olive oil pouring bottles! With this one, you are buying the best. We love the stylish shape. Perfect for gifts too! Click Here for Butcher Block Tables & Carts! Our private label vinegar is great on salads and try it in your pasta sauces! This high quality Balsamic Vinegar has been aged for at least 8 years in traditional oak and chestnut barrels. It is smooth and rich with a slight sweetness. The 16 ounce bottle is in a light green glass, made in Italy, it can be refilled. You can order two and refill one with olive oil! The spouts are available below. Excellent on salads, pasta, pizza, bread and used to flavor sauces! One of the best balsamic vinegar for cooking. It is also available in a 5 liter jug with a bottle filling spout if you want to fill your own bottles. 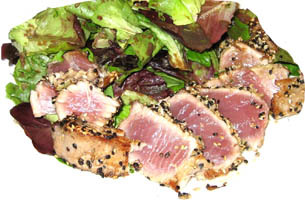 Chefs Note: We have done extensive taste tests with dozens of Balsamic Vinegars and this is one of the best for greens! Click Here for Dry Morel Mushrooms! This is Traditionale 35 year old aged Balsamic Vinegar from Modena's Consorzio in Italy. It is sweet, thick and smooth with very low acidity. Used by sprinkling a few drops on pizza, pasta, salads and with bread and oil! 3 1/2 ounces. This bottle comes in a formal gift box presentation. Chefs Note: This is the thickest and richest balsamic vinegar you can buy. The taste is amazing, liquid gold! It is very thick like maple syrup and yes, it tastes better. A perfect gift for the gourmet who has tasted almost everything. Guaranteed lowest price. Click Here for the finest Spanish Saffron! Our white truffle oil is the strongest truffle oil we have tasted. Bottle changed to the one pictured on right. It comes from the source of the most highly prized white truffles - Italy. Chefs Note: It has a wonderful truffle flavor and is slightly addictive. We like to use it with crusty bread and baby greens! It is strong enough to add a few drops to a sauce or vinaigrette dressing and taste the truffle flavor. Click Here for the finest Whole Truffles! These bottles make perfect gifts! Truffle facts and pictures! Click Here! Our black truffle oil is the strongest truffle oil we have tasted. It comes from the source of the most highly prized white truffles - Italy. Extra Virgin Olive Oil with pepper and herbs, 2 oz. - from Italy. Chefs Note: A great wedding favor, or use it for centerpiece of your next private party. Email your details for prices (minimum order 72 pieces)! Extra Our Balsamic Vinegar comes in a small gift bottle, 2 oz. - from Italy. Chefs Note: A great wedding favor, or use it for centerpiece of your next private party. Call for Large Quantity Discounts! The Italian Waiters Wine Opener features a dark blue body. The screw and 2 step lever work great and make this opener easy to use. It is 5-5/8 in. long x 3/4 in. wide and just over 1/4 in. thick! These wine openers are made in Italy, very high quality. Limited supply. 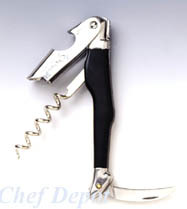 We have hundreds of other styles of Wine Openers, Click Here! Custom Hot Stamping & Quantity Discounts, Please Call Us! 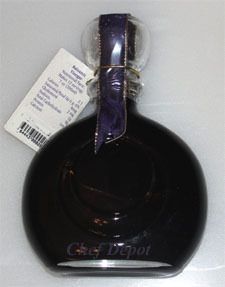 Extra Our Balsamic Vinegar comes in a handmade Italian Grape Cluster Gift Bottle, 7 oz. - from Italy. Email your details for prices (minimum order 72 pieces)! Our Extra Virgin Olive Oil is cold pressed, it comes in a handmade Italian Grape Cluster Gift Bottle, 7 oz. - from Italy. These cheese knives make perfect gifts! Our White Zinfandel Vinegar comes in a handmade Italian Grape Cluster Gift Bottle, 7 oz. - from Italy. These tongs and spatulas make perfect gifts! Our Extra Virgin Olive Oil is cold pressed, it comes in a handmade Italian Gift Bottle, wax sealed with tied rafia, aprox. 8 oz. - from Italy. These cuttingboards make excellent gifts! 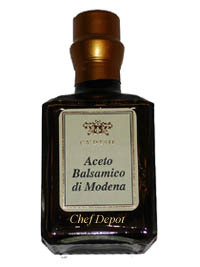 Our gift jug of Balsamic vinegar is amazing, it comes in a handmade Italian Gift Bottle, wax sealed with tied rafia, aprox. 8 oz. - from Italy. Your new kitchen needs the best cutting board! This truffle oil is one of the best truffle oils that we have tasted! A few drops go a long way towards enhancing any dish. Try mixing with mashed potatoes or polenta and serving with any robust meat. Pair it with shaved Parmesan to turn any risotto or pasta into a quick gourmet meal or simply drizzle it over antipasto for the ultimate appetizer. Use it with eggs to turn a simple breakfast into a special brunch. While both types of truffles are unmistakably intense, black truffles impart a more rustic and earthier flavor than their white counterparts, which are lighter and more delicate. White Truffle Oil, 6.5 oz. Click Here for Holiday Cake Pans, Wreath, Santa, Lamb and more! This is our new exclusive Kyocera Ceramic Salad Set. These hold an edge without sharpening. This is a great gift set, comfortable and easy to use. This ultimate ceramic prep set includes: a 5 in. Slicing knife, The Perfect Peeler, and Adjustable Mandoline. The knife is the ultimate cutting tool for every day slicing of fruits, vegetables, boneless meats and fish. The Perfect Peeler is adjustable, for right or left-handed usage, and can peel at versatile angles for ease of use. The non-slip ergonomic handle makes peeling tasks quick and precise. The Adjustable Slicer offers slices from paper-thin to 3mm with a simple turn of the rotating bar on back. A handguard is included to hold foods in place and protect hands while slicing. 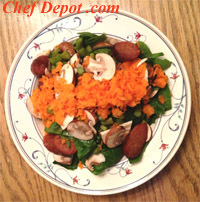 looking for a quick and easy way to prepare healthy meals everyday. Please note the red set has a black handled knife, peeler and slicer are red. Click Here for more Ceramic Knives! Simply the best! Chef Notes: LOVE the gift box. We tested several brands of ceramic knives - Here's the results! Kyocera was the only knife sharp enough to meet our demands, the others were too dull or the blades were too thin and brittle. Only Kyocera scored very high in sharpness, quality, workmanship, material and warranty. A great gift idea! These knives are a great choice for Chefs and Gourmet Cooks! Ceramics are perfect for slicing, dicing, chopping and mincing meats, garlic, carrots, onions, celery, fruits and more! Special Limited Time Offer! Click Here for Maple Chopping Blocks! Simply the best! Black Truffle Oil, 6.5 oz. Click Here for Chef Knife Sets! The best you can buy! This truffle oil is one of the best truffle oils that we have tasted. It comes from the source of the most highly prized white truffles, from France. White Truffle Oil, 8.5 oz. This high quality Balsamic Vinegar has been aged for at least 6 years in traditional chestnut and oak barrels in Modena Italy. This beautifully shaped bottle includes a high quality pourer spout. It is thick, smooth and rich with a slight sweetness. Excellent on salads, pasta, pizza, bread and great in tomato sauces! Some even like it on ice cream and desserts! Chefs Note: A perfect and unusual gift. We have done extensive taste tests with dozens of Balsamic Vinegars and find this the best balsamic vinegar available for under $50.00 a bottle! Click Here for great Cutlery on sale! This is a new Kasumi Titanium Filet & Carving Knife, with a 7 3/4 in. blade, it's the sharpest and slickest blade made. The edge that it holds is hair splitting and remains throughout heavy use. The non slip ergo poly handle is very comfortable and virtually indestructible, perfect for every serious Chef. We could not believe how sharp these knives were until we tried each one. It simply glides through most any food. The outstanding Kasumi Titanium coated blade has been achieved by combining the best of advanced modern manufacturing. Keeps a sharper edge longer than other knives. Made in Japan. Chefs Note: Slicker than oil on water! Possibly our favorite knife. Cuts through sushi rolls like butter. Comfortable, lightweight and perfectly balanced. Each knife is carefully finished by the hands of skilled craftsmen. You will love this knife! Mfr. Limited Lifetime Warranty. Free Shipping in Cont. USA! Click here for more Titanium Knives! This is Liguaria aged Balsamic Vinegar from Modena Italy. It is sweet and smooth with the perfect acidity content of 6 percent. We like to use it in vinaigrette salad dressings, marinated meats, pasta dishes and with bread and oil! 16 ounces. Chefs Note: A great bottle for the patio table! Click Here for Bulk European Chocolate! Balsamic Vinegar from Modena Italy! A sampling of three bottles (16.9 oz each) of our high quality Balsamic Vinegars. All imported from Italy. Each vinegar has been aged in traditional oak and chestnut barrels. 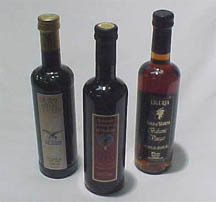 The set of three contains one white, one medium sweet and one dark balsamic bottle, each with a different taste. Chefs Note: We have done extensive taste tests with dozens of Balsamic Vinegars and these are excellent on salads, pasta, pizza, bread and used to flavor sauces! Some even like it on ice cream! Click Here for the best Vanilla Extract! 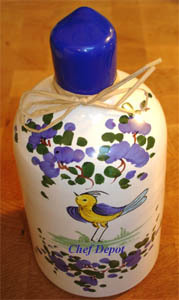 This is our Handpainted Italian Ceramic Bottle with Reserve Extra Virgin Olive Oil. Handpainted by Italian crafters, each bottle is different, bottle stands 8 in. tall and has a reusable cork. It is a refillable 19 1/2 oz. jug with a built in slow pour spout. It is filled with an excellent mild flavored first cold pressed Mission Style Extra Virgin olive oil (has an amazing nutty taste). Perfect for dipping oil with fresh bread. Chefs Note: We have done extensive taste tests with olive oils! If you buy the first cold pressed extra virgin olive oil, you are buying the best. We love the handpainted bottle, the oil is the best too! Perfect for holiday gifts! Large Quantity Discounts! This stainless steel Oil & Vinegar Pour Spout is made to last. It will fit our vinegar bottles above and many olive oil bottles! Chefs Note: The spout has a durable flexible plastic liner that is made to last. Click Here for Spices & Peppercorns in all colors! This is our Ceramic Olive Oil Drizzler. It is refillable, holds about 16 oz. with a built in stainless steel slow pour spout. Using a bottle with a tapered spout will give you a more controlled pour every time. New style is pictured on right. Chefs Note: Chef Marios favorite for oils! We have done extensive tests on olive oil pouring bottles! Get this one, you are buying the best. We love the stylish shape and natural color. Perfect for gifts too! Large Quantity Discounts! A sampling of the finest ~ Extra Virgin Olive Oil. The Chefs will select you a special bottle from our large collection. These all have an excellent mild flavor and first cold pressed Extra Virgin olive oil. Add a clove of garlic and some herbs for a nice zesty dipping oil with fresh bread. Chefs Note: We have done extensive taste tests with olive oils! If you buy the first cold pressed extra virgin olive oil, you are buying the best. This smooth oil is full flavored with a medium green color. Limited Production, so brand may vary, always highest quality. 16 oz. to 32 oz. sizes and bottle shapes vary. Perfect for holiday gift baskets too! This is a new Kasumi Damascus Wide Utility Knife with a 5.5 in. blade, it's the sharpest damascus blade made. The edge that it holds is hair splitting and remains throughout heavy use. The non slip ergo handle is very comfortable and virtually indestructible, perfect for every serious Chef. We could not believe how sharp these knives were until we tried each one. Kasumi knives are made from 33 layers of stainless steel in Seki Japan. Kasumi V Gold No. 10 Damascus Knives are crafted from the most advanced materials with the most advanced manufacturing techniques. Only the middle layer acts as the cutting edge, and it is made using V Gold No. 10 stainless steel. Each Kasumi knife blade is a high carbon stainless steel with cobalt, manganese, molybdenum and vanadium for added durability and ease of sharpening. The layers on both sides of the Kasumi knife V Gold No. 10 core are made by repeatedly folding together two different types of stainless steel and forge welding them by hand until you have sixteen exceedingly thin alternating layers. These sixteen layers are then forge welded to both sides of the V Gold No. 10 core. The addition of cobalt to this steel requires special tempering in order to maximize the full benefit of this steel. The technique for this special tempering is a closely guarded secret. Each Kasumi knife has a laminated pakka wood handle secured with stainless steel rivets. They also have a full tang. The handle is made from multiple layers of wood impregnated with a plastic resin. The handle is riveted to the tang. Chefs Note: This is the sharpest knife out of the box! Possibly our favorite knife. Comfortable and perfectly balanced. Each knife is carefully finished by the hands of skilled craftsmen. You will love this knife! A beautiful knife that will provide a lifetime of use and the ultimate in performance. Lifetime Warranty. Click here for More Kasumi Damascus Knives! Free Shipping in Cont. USA! Click here for Pub Height Bar Tables! Click Here for Pure Vanilla Extracts! Lyptus Chopping Blocks on sale now. The round end grain butcher block construction is knife friendly! Our farm raised Lyptus comes from foresters that carefully select trees to provide a sustainable resource. Perfect for daily meal preparation and serving cheese & holiday appetizers! Oiling it with mystery oil, will keep it looking new for many years of use! Free Shipping in Cont. USA. We love the eco friendly heavy dark red wood! Pictured with our Messermeister German Utility Knife! Click here for more USA made Cutting Boards! This is our Mama Cortina Extra Virgin Olive Oil from Italy. 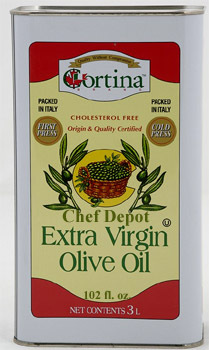 It is an excellent medium flavored Extra Virgin olive oil from Italy. Add it to the drizzler bottle above. 3 Liters, 102 fl. oz. The metal can keeps it fresh a long time. Glass and ceramic bottles are good too. No plastic tasting oils here! Chefs Note: Slice a little garlic, lightly brown in hot oil using a saute pan, pour onto dipping plate and add some chopped rosemary, enjoy with toasted bread! The can has changed but the quality is the same. Click Here for more Ceramic Knives! Click Here for Breakfast Bar Island Tables! Our new 2 tone Bamboo Chop & Dice Picnic Board measures over 9 in. x 6 in. x 3/4 in.! Made from a select grade of bamboo, it's a totally sustainable natural resource. After harvesting bamboo it grows back quickly since the root system is so dense. Our bamboo products are handcrafted using small bamboo strips glued and pressed together with approved food grade glue (edible). A heating process makes the natural sugar in the wood turn brown to create beautiful colors. Chefs Note: We like to use our bamboo boards for parties and special events. These cutting boards simply wash off with soap and water. Oil it every month with Emmets Elixer, to keep it looking new. Bamboo cutting boards make an attractive serving and chopping surface. Another great gift idea! Colored Non Stick Tongs! Save your Non Stick Pans! This cheese knife set makes the perfect accent for your holiday entertaining. Each piece is handmade from the high quality stainless steel and solid Cherry wood. Each piece is made in the traditional shape and each one has a distinct use. 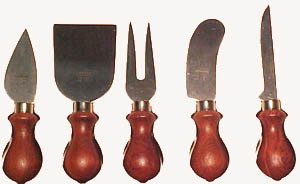 The set contains a wide blade cheese knife, a bell shape, a serving fork, spreader and a slicer. This knife set is excellent for cutting and serving chunks or wheels of cheese on a cheese tray or bamboo cuttingboard. This imported set is made to last! Add a Bamboo Cheeseboard (click for picture)! Click Here for Magnetic Knife Holders! Click here for Cutlery Sets! Our Cold pressed Walnut Oil is tasty and good for you! Natural first pressing preserves the flavor, micronutrients, minerals and vitamins in this exotic oil. This oil is high in monounsaturated good fats which lower LDL cholesterol levels. No additives or preservatives with no cholesterol. No Carbohydrates- Suitable for use on all Low Carb eating plans. Rich in naturally occuring Vitamin E, a nice nutty tasting edible oil. No bad trans fatty acids. 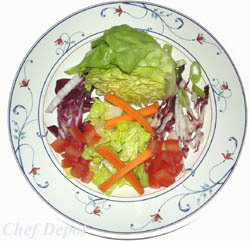 Besides being good for you, Walnut Oil is delicious used in salad dressings, marinades, baking, roasting and grilling. Packaged in a nice resealable tin. Product of France. Choose from 2 sizes below. Chefs Note: Ideal for salad dressings and drizzling on baby greens and heirloom tomatoes or a sauteed wild mushroom appetizer. Customer Note: Your Walnut Oil has a smooth and complex nutty flavor. It is amazing on baby greens and appetizers. Chef Ken, Lettuce Entertain You Restaurants. Our Cold pressed Avacado Oil is tasty and good for you! Natural first pressing preserves the flavor, micronutrients, minerals and vitamins in this exotic oil. This oil is high in monounsaturated good fats which lower LDL cholesterol levels. No additives or preservatives with no cholesterol. No Carbohydrates- Suitable for use on all Low Carb eating plans. Rich in naturally occuring Vitamin E, a nice nutty tasting edible oil. No bad trans fatty acids. 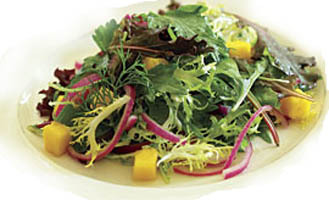 Besides being good for you, Walnut Oil is delicious used in salad dressings, marinades, baking, roasting and grilling. Packaged in a nice resealable tin. Product of France. Choose from 2 sizes below. Chefs Note: Ideal for salad dressings and drizzling on baby greens. Customer Note: We love to use this on baby greens with heirloom tomatoes and goat cheese croutons. It is amazing on baby greens and appetizers. Chef Ralph, Greenbriar Club. These high quality solid stainless steel and acrylic oil and vinegar sprayers make it easy to put a mist of your favorite toppings on salads and foods. Excellent for food presentation, these sprayers help achieve a shiny finish on many items. It can also help while dieting (oil and vinegar is very healthy dressing and you will use less). We like to use these for food styling photo's and for lightly misting truffle oil onto pizzas. Choose your oil and vinegar sprayers below. Handcrafted in Europe to our exact requirements. 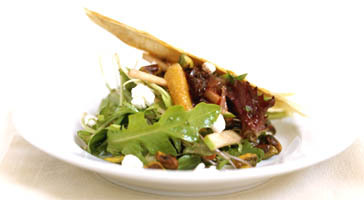 Chefs Note: The salad, Organic Mesclum Greens with carmelized pecans, gorgonzola, onions and pears is a big hit on the menu. The oil and vinegar sprayers leave a nice fine mist on the delicate greens. Chef Selected High Quality Knife Sets are on sale! Our new Laguiole Waiters Corkscrew with natural Black Horn. 4.5 in. long, unbreakable black horn handle, stainless steel bolsters, micro-serrated blade, cap opener! Leather storage case. Features a small metal bee on one end. The etched "bee" emblem (Napoleon's symbol representing industry, efficiency and productivity), ensures that each piece is a genuine Chateau Laguiole. These openers not only make a perfect gift for any wine lover but a great conversation piece! Handmade in France. Watch the review below. Click the bees for more Lagiole openers! 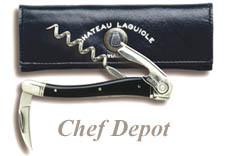 Reviews high quality Laguiole wine openers Click Here for Professional Chef Knives! Get your knives razor sharp with our sharpening stones! Get a fast edge and maintain your sharp knives with our sharpening steels! Chef is using one of his Favorite NSF Stainless Steel Tables. This is a new Kasumi Titanium Santoku Knife with a 7 in. blade, it's the sharpest and slickest blade made. The edge that it holds is hair splitting and remains throughout heavy use. The non slip ergo poly handle is very comfortable and virtually indestructible, perfect for every serious Chef. We could not believe how sharp these knives were until we tried each one. It simply glides through most any food. The outstanding Kasumi Titanium coated blade has been achieved by combining the best of advanced modern manufacturing. Keeps a sharper edge longer than other knives. Chefs Note: Slicker than oil on water! Possibly our favorite knife. Comfortable, lightweight and perfectly balanced. Each knife is carefully finished by the hands of skilled craftsmen. You will love this knife! Mfr. Limited Lifetime Warranty. More Titanium Knives ~ Click here!Free Shipping in Cont. USA! 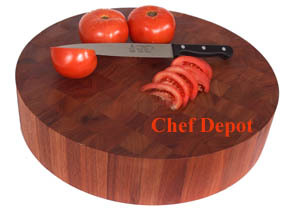 Click here for Chef Tables & Chop Blocks! This is a new Kasumi Knife Sharpener. It is a handy little sharpener that's necessary to avoid scratching the titanium or polish on any high quality knife. It is easy to use. Simply add a few drops of water to the unit and pull the knife through several times. It features 2 slots, one has a ceramic wheel that turns and one has a diamond wheel that turns. It will sharpen the titanium knives, or any good quality knife blade quickly and easily. It also sharpens ceramic knives by using the diamond wheel only. Our new Laguiole Waiters Corkscrew in Black Horn. 4 in. long, unbreakable imitation black horn handle, stainless steel bolsters, micro-serrated blade, cap opener! Features a small metal bee on one end. The etched "bee" emblem (Napoleon's symbol representing industry, efficiency and productivity), ensures that each piece is a genuine Chateau Laguiole. These openers not only make a perfect gift for any wine lover but a great conversation piece! Handmade in France. Click on bees for more Laguiole openers! Made to last for Generations. The rock maple butcher block is really a great idea for your kitchen counter! Made in the USA! Maple End Grain Chopping Blocks - Click Here! This is the Pepsi Wall Mount Bottle Opener. This is an exact reproduction of the high quality antique opener, cast iron, gift boxed with screws included. Aprox. 3 1/4" tall. Chefs Note: A timeless classic, perfect for bars and cabinets. Makes a very nice gift! To get your Coke Wall Mounted Bottle Openers, click here! Click Here for Electric Diamond Knife Sharpeners! Click Here for Vanilla Beans & Extract! This is Felchlin Grand Chocolate imported from Europe! Each 1.1 lb. Bar is made from single roasted criollo beans, these are the rarest 3% of all cocoa beans produced. Each Bar has a unique blend of flavors, the "Marcaibo Clasificado" 1.1 lb. bittersweet bar contains 65% cocoa, Cocoa Butter, Sugar, Milk & Cream, Vanilla & Natural Flavors. Each gift packed bar has a unique taste! These chocolate bars make wonderful gifts! It is High Quality Chocolate, the finest we have ever tasted and we use this in our desserts. Each Block comes with a purity certificate from the Swiss government! 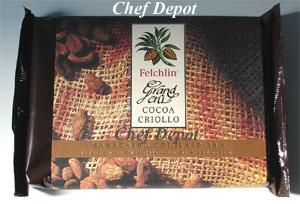 Chefs Note: We love Felchlin pure chocolate. Wow, this is great chocolate! Click Here for more Chocolate blocks, bars and coins! Click Here for Chef Tables! Design your new kitchen! This is the best Wasabi Powder you can buy! 100% pure green horseradish root, powdered in Japan. Ours comes in a reusable resealable airtight jar so you can mix up a small batch (just add a little water) and reseal it for later use. 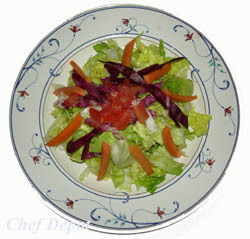 It is great for sushi rolls, in salad dressings & marinades and dips. 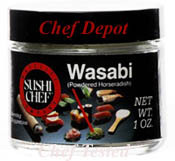 Chefs Note: We tried many other wasabi brands, sushi kits and sushi cookbooks, we find this to be the best wasabi powder! Click Here for Bamboo Cutting Boards! Click Here for Sushi Knives! Chef Tables for Less! Click Here! Our Cold pressed Grapeseed Oil is tasty and good for you! Natural first pressing preserves the flavor, micronutrients, minerals and vitamins in this exotic oil. Grapeseed Oil is high in monounsaturated good fats which lower LDL cholesterol levels. No additives or preservatives with no cholesterol. No Carbohydrates - No Trans Fats, No Sodium, Suitable for use on all Low Carb eating plans. It has a delicate taste and a yellow color with green hues. Rich in naturally occuring Vitamin E, this Oil has a high smoke point, allowing it to be heated to an efficient frying temperature without burning or breaking down. No bad trans fatty acids. Besides being good for you, this Oil is delicious used in salad dressings, pan frying, baking, roasting and grilling. Imported from Italy. Click Here for Olive Oil & Grapeseed Oil Facts and Health Information! Do you have Sharp Knives in your kitchen? Many Chef Sets are on sale! Click the page links and green arrows below to view more products!